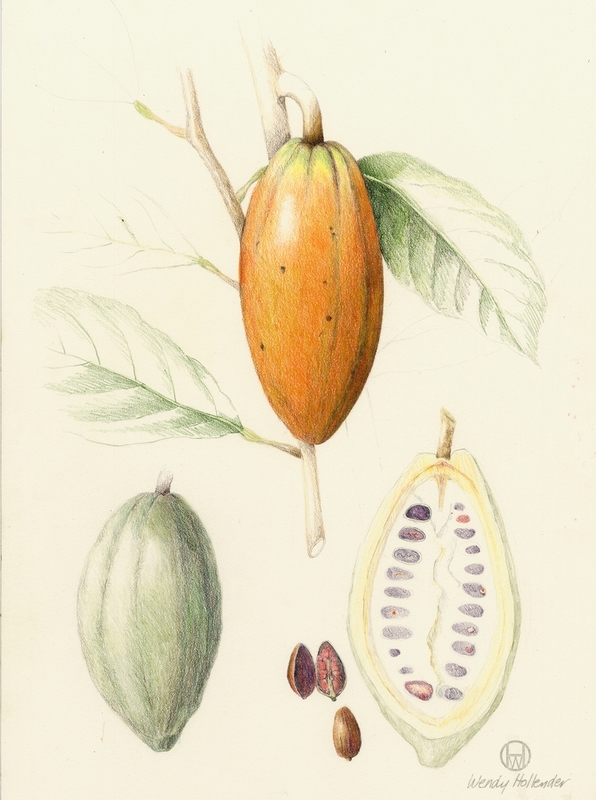 Botanical illustrations of chocolate — Theobroma cacao of the Malvaceae family on left; and coconut — Cocos nucifera of the family Arecaceae palm family on right, rendered by Wendy Hollender in Hawaii. Recipe excerpt from Foraging & Feasting: A Field Guide and Wild Food Cookbook. Coconut milk and chocolate, in almost equal parts (1¼:1) mix together to create this decadent, rich substance. At a cool room temperature (around 60ºF), it has a firm, stiff consistency for pie and pastry fillings, or for frosting cookies and cakes. When warm, it's great for pouring onto fresh, wild berries, fruit crisps, ice cream, or whipped cream. 13.5 oz unsweetened coconut milk (I use an organic canned variety with three ingredients listed: coconut, water, and guar gum, see first image below). Place chocolate in a quart-size, heatproof bowl (ceramic, Pyrex, or metal). Heat coconut milk in a small saucepan, bring to a gentle simmer, and then pour hot cream onto chocolate. Let sit for a couple of minutes and then stir until well mixed. (If chocolate is not fully melted, place bowl that contains the chocolate into a larger bowl that contains hot-to-the- touch tap water (115-120ºF) and stir until chocolate is thoroughly melted.) At this point you can use it as a chocolate sauce to drizzle onto wild berries, ice cream, whipped cream, and more. To use as a pie filling, pour chocolate sauce into prebaked and cooled crust or All Raw Pressed Crust. Then let set and firm up by cooling to 65ºF before serving. To use as a frosting, spread the ganache onto cakes and cookies after is has thickened a bit, but before it becomes too stiff to spread. To store ganache, cool to room temperature, cover tightly, and place in the refrigerator, where it should keep for at least a week. After being stored in the refrigerator, the chilled ganache stiffens and needs gentle warming before use as a pie filling or sauce. To warm ganache, simmer water in a pot large enough to hold the heatproof container of ganache. Remove the pot of water from the heat source, and place the container of ganache into the hot water. The water level should come up the sides of the container, but not over them; keep water out of the chocolate at all times. Let sit for several minutes until it becomes a thick liquid again. Then stir well to emulsify (which sometimes takes several minutes) and use as desired. Cream & Chocolate Ganache Variation: For a dairy version use heavy cream (preferably organic and grassfed) in place of the coconut milk in the above recipe. The final creation: ganache drizzled on banana, red currant and Nourishing Traditions almond cookie.